Our 25% off Toad Hollow Mineral Sale continues at Anita's Beads. 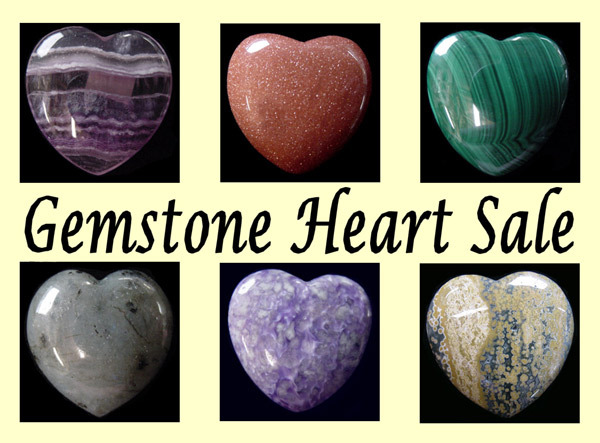 This week's special (beginning Saturday January 22nd and ending Friday January 28th) is on hearts. 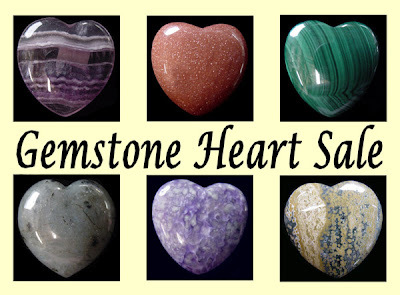 All gemstone hearts in stock are 50% off. So choose your Valentines Day gifts early for the best selection! I was updating my Toad Hollow Minerals information page the other day because I noticed the links to most of the photographs were broken. 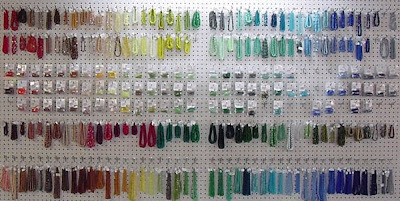 This activity got me thinking about the history of Anita's Beads. 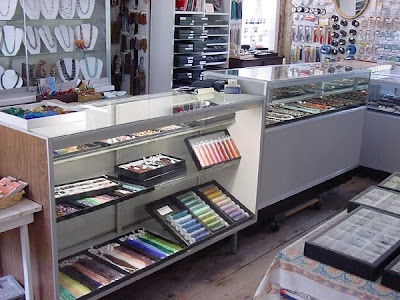 I started my first business, "Designs On You," back in the late 70's when I was living in Beverly, Massachusetts. I produced silk-screened t-shirts, batik (the wax resist dye technique that was my major self-taught discovery for that decade) pillows and quilted wall hangings, quilted ornaments, and objects embellished with applique and/or embroidery. Then came major discovery number two: minerals and beads. I began selling quartz crystals and beaded sterling silver jewelry with a partner as "Underground Sterling & Stone." 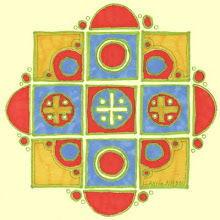 My partner was a salesman and the jewelry I produced was sold, for the most part, to New Age/Alternative Healing gift shops. When I moved to New Hampshire in 1996, I decided to look for a place that could accommodate a home-based retail shop. I purchased the property then known as "Toad Hollow" in Wakefield. I moved in June and by the fourth of July I had established "Toad Hollow Jewelry" in the carriage house attached to the barn. By October the unheated space was too cold for comfort so I moved the operation into house occupying the room which is now Studio 2. Once filled with display cases, the room seemed very small! At the time I was working as a children's librarian in the nearby town of Wolfeboro so in March 1997 I decided to open "Venus Rising," a mineral, crystal, bead and jewelry shop with a decidedly New Age flavor there. 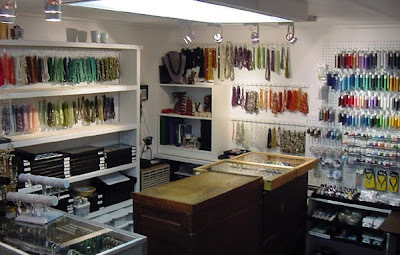 Venus Rising closed in May of 2000 when I shifted my focus back to Toad Hollow full-time and expanded the business to occupy the barn (for minerals) and the carriage house once again (for jewelry and beads). Only this time the buildings were heated! 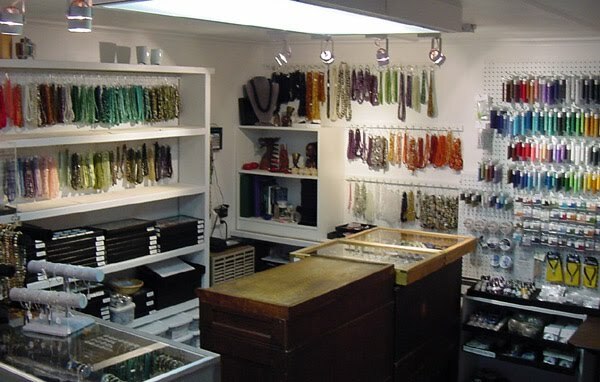 Below is a photo of the carriage house as bead room. Then bead part of the business became more popular than the rest and required more space, so the barn became a bead shop. 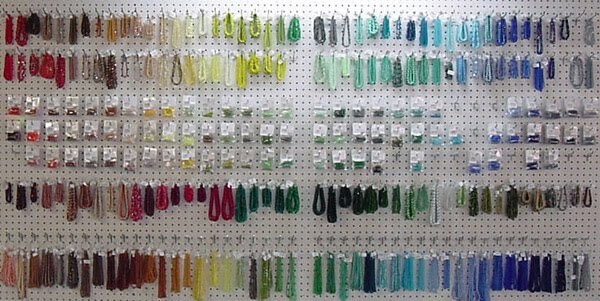 In September 2006 I officially started "Anita's Beads" and added a large selection of Czech glass beads to the inventory. 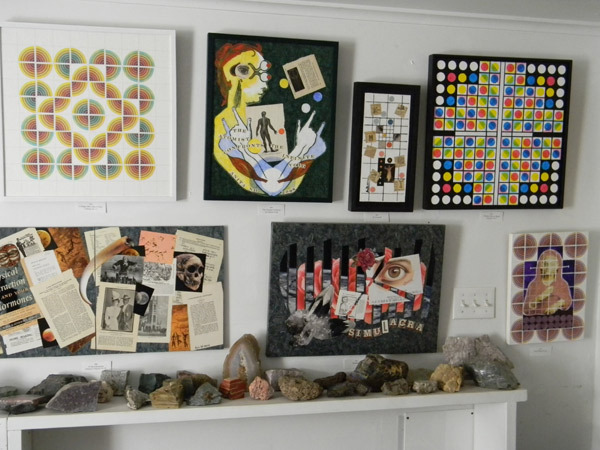 And having made major discovery number 3 which was collage, the carriage house became my gallery. I'm working on a new display for the check-out counter on the right to show some of the lovely Toad Hollow crystals on sale this winter and will put up photos here soon! I'm excited to report that one of my photographs of Coprolite or "petrified dinosaur poop" has been included in Exotic Gems, Volume 2 by Renee Newman. The book is due to be released next month at the Tucson Gem and Mineral Show. 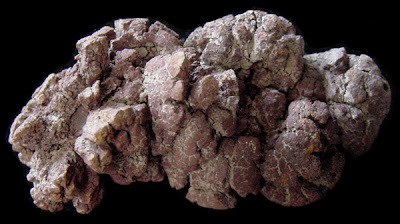 You can see more photos of Toad Hollow coprolite, in addition to other fossil and mineral specimens online. Specimens are available for purchase at Anita's Beads in Wakefield, New Hampshire. Don't forget our 25% off Winter Sale on all Toad Hollow minerals, crystals and tumbled stones which runs through March 21st. At Anita's Beads we are having a sale on our entire collection of Toad Hollow Minerals. 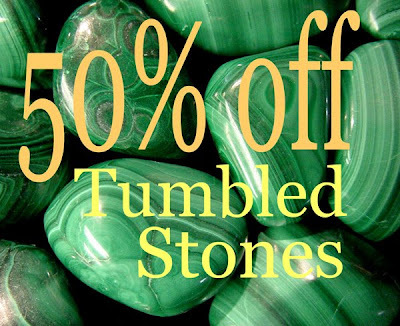 Take 25% off of tumbled stones, rough stones, crystals, and mineral specimens beginning today. The sale will continue through March 21st but supplies are limited to stock on hand so shop early for the best selection. In addition, weekly specials will be offered at an additional 25% off. This week's special is tumbled stones. Wire-wrappers take note: stock up on tumbled stones at 50% off now through Friday January 21st. 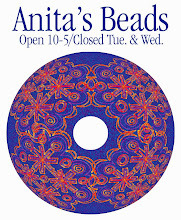 Watch for our next weekly special to be announced on Anita's Bead Blog! I've also been doing some long overdue revision work on the Toad Hollow Minerals site. All broken links on the Site Index page have been updated or removed to eliminate the annoying "404 Page Not Found" error messages. Additional work will be forthcoming!